I marinated cod in sake-kasu (sake lees paste). One pound of cod filets were seasoned with salt and refrigerated for about 30 minutes beforehand. For the marinade, I blended about 6 oz sake-saku (hard paste) and enough amount of mirin (about ¼ cup?) to make the paste smooth to spread. Each piece of fish was coated all over with the marinade, covered, and let refrigerated for 24 hours. When the fish was ready, I wiped off the marinade with papertowel. 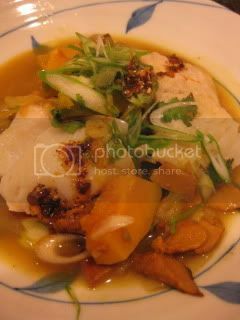 The marinated fish is great to serve by simple grilling or baking, but this time, I made one-pot donabe steamed dish with my tagine-style donabe, “Fukkura-san”. First, in the skillet of Fukkura-san, I sautéed shallot, ginger, garlic, and lemongrass in olive oil. Added some wild chanterelle mushrooms (gift from my friend who picked them). 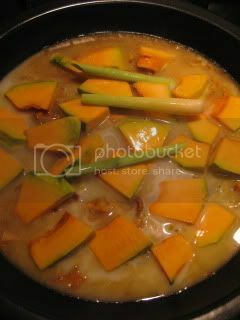 When the mushrooms became soft, curry powder was added and stirred, and some kabocha and top parts of lemongrass were added. Sake, coconut milk, soft sake-kasu and some water were added, then topped with sake-kasu marinated fish (marinate was already wiped off). It was covered and cooked for about 10 minutes. An easy one-pot tagine-style donabe dish was ready. The aroma was so beautiful! The entire donabe was served at the table and served with some cilantro and scallion. The taste was really nice. The addition of sake-kasu in the sauce made a big difference. 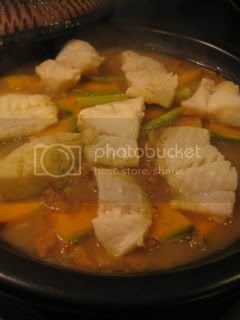 You can also make this dish without marinating the fish (just season the fish with salt and pepper) and it would still taste nice, but I love the sake-kasu marinated fish in this dish, since it gives nice deep flavor. 1. 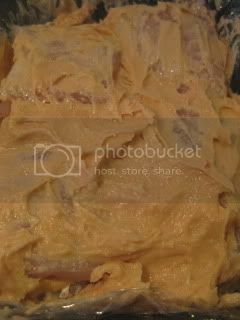 To make the marinade, by using a food processor, blend 6 oz sake-kasu and mirin. Add more mirin if the paste is too thick. 2. Cut the fish filet into smaller pieces and season lightly with salt (both sides). Let rest in refrigerator for 30 minutes. Pat dry with papertowel. 3. 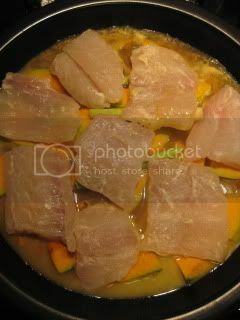 In a shallow container, spread all over the fish with the marinade. Cover and let rest in refrigerator for 24 hours. 4. Wipe off the marinade from the fish (or you can lightly rinse with cold water), pat dry with papertowel and set aside. 5. Whisk together the coconut milk, soft sake-kasu, nam pla, sugar, and water. Set aside. 6. In the skillet of Fukkura-san, sauté the garlic, ginger, shallot, and lemongrass. When they are soft and aromatic, add the mushrooms and continue to sauté. Add the curry powder and sauté until aromatic. 6. Deglaze with sake. 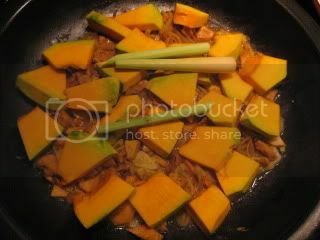 Add the kabocha and remaining lemongrass (stalk). Arrange the fish on the top. 7. Add the sauce mixture to the skillet and cover. Cook over medium to medium+ heat for about 10 minutes or until everything is cooked through. Turn off the heat and let sit for 3-5 minutes. 8. Serve at a table with the condiments.